I am the smallest of the four breeds of Swiss mountain dogs, but I am pretty strong for my size. My relatives in Switzerland still have jobs pulling milk carts and they enjoy what they do, but I am looking for a job on a farm with a nice family. Some of my cousins live in the city with their people and they tell me how much fun they have there. I guess that my breed is what you might call versatile, because we fit into a lot of different lifestyles. It might be because we are not real big, we don�t require a lot of maintenance, and we are very intelligent. I�ll vote for that. When fully grown, I am about 20 inches tall (50.8 centimeters) and I weigh between 55 and 65 pounds (24.8 to 29.3 kilograms). We have no Entlebucher Sennenhund Breeders listed at this time. 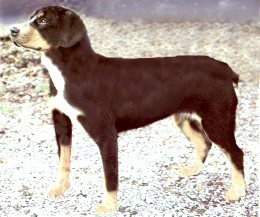 Click here to place your Entlebucher Sennenhund Ad!